I’m thrilled today to let you know about a brand new class called Terrarium World that I’ve created and that it’s open for registration with an early bird offer of £35/$50 for a limited time (regular price £45/$59). The class begins on 15th April 2019. I’m fascinated with terrariums - these little tiny micro worlds and how they enable us to experience a little of the outdoors, indoors and with gales blowing outside, this class has been such a blessing to create. I can’t wait to show you, from beginning to end, how to create both a ‘closed’ (with a lid) and ‘open’ (without a lid) terrarium. There’s a lot of information online on how to create a terrarium and it can get a little confusing but now that I’ve done all the research and created some for myself, I feel I have a really good understanding and would like to share the fun with you! 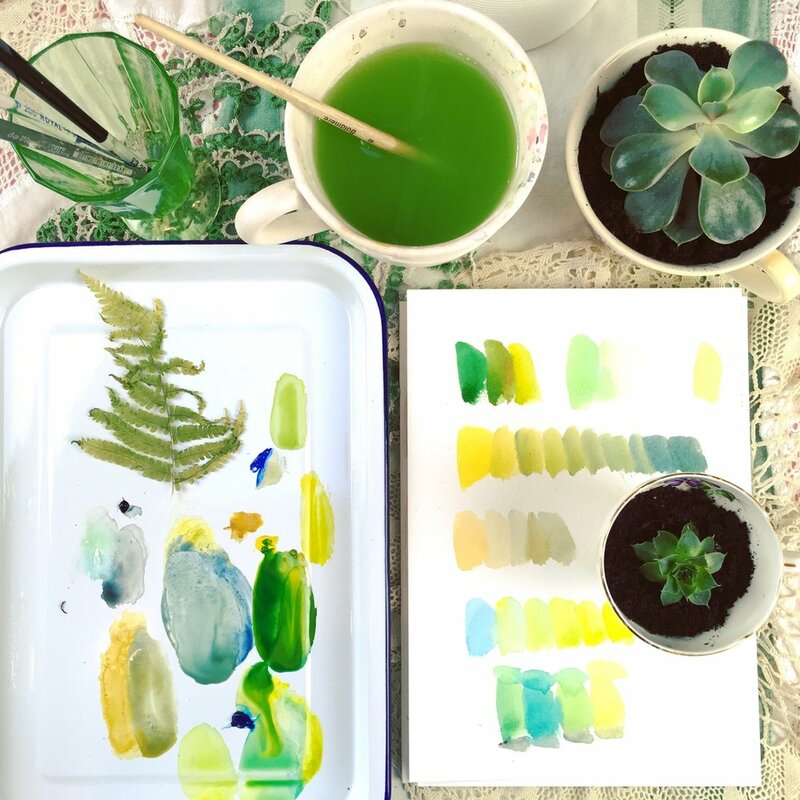 Being an artist, there just HAD to be an art element to this class, so you can look forward to exploring mixing greens, creating fern themed fridge magnets, painting a beautiful watercolour succulent and experience delight whilst creating a soft pastel painting featuring succulents and shells. Oh and I share how you could ‘customise’ any add ons with paint that you might want to add to your terrarium world. My deeper desire to create this class came from listening to the weather storming away outside and feeling overwhelmed and busy on the inside. I really wanted to create a terrarium and have it remind me to take time to be with God. I wanted it to feel and look like a miniature garden that I could peek into and imagine myself sitting down at a pretty table with a pot of tea steaming away and give myself some time just to sit and rest. From there, I wanted to inspire our youngest son (he’s 13 yrs old) to do the same and he excitedly picked out a miniature tree house and wanted to include that in his terrarium and you’ll get to see us both in that video lesson. It’s been such a joy and giggle to have him in this class and his enthusiasm is fantastic! (You can see Benjamin in the first pic in the gallery photos above). I couldn’t stop there though, I wanted to try and capture the beauty of the plants that I was planting into the terrariums and with extra ones I had left over, I planted them into a precious bowl that my beloved Granny used to own many years ago that had been sitting on my windowsill waiting to come to life. So, I hope you can see how this has been such a blessing for me to create and my prayer is that these gentle activities in Terrarium World help quiet your mind, embrace beauty and find rest in God too. I’ve been contemplating the idea of ‘contentment’ a lot these days as I’m putting together my online class called The Art Of Contentment. As Joshua Becker writes in his book The More Of Less, learning to feel content is a lifelong process and it doesn’t come naturally but it’s well worth trying. Pin this post by clicking the image above. Resting in who you are, who you have, and what you have. To have contentment is to be comfortable with the world. Thinking of the definition of contentment above, isn’t that what we all want? To feel comfortable with the world? I say yes! There are so many ways to create a portrait and depending upon my mood I may create a soulful portrait, an expressive portrait or a portrait with a lot of attention to detail. It varies… For when I’m feeling super overwhelmed, you can’t beat some dark and smoky charcoal to melt away your worries. If I feel less muddled, I might want to get a little more detailed and pencil works well with this. If I’m feeling upset (or happy), collage works. There’s something so freeing about the gathering of juicy supplies, some journal writing and a lot of items to adhere to my substrate that clear my head, heart and mind (see below). Mark making (see the background of the painting below) also helps with feelings of stress and overwhelm. There’s something about making small identical marks and many of them, that feels very cathartic and relaxing; meditative in fact. So, I hope I’ve given you some ways to bring a little contentment into your life. Painting really does help your soul to breathe in the midst of chaos. There’s something about painting that enables your conscious brain to ‘wait in the wings’ leaving your subconscious permission to flow and then in that timeframe a shift occurs. Try it and let me know in the comments below how you got on and your thoughts on finding contentment in a busy world. Take care and here’s to ‘contentment’ and The Art Of Contentment. PS. if you are interested in my new class, the early bird offer of £95 will only last until 5th December 2018 and then the price will increase to £150. Class available throughout 2019 and beyond. All videos will be downloadable. 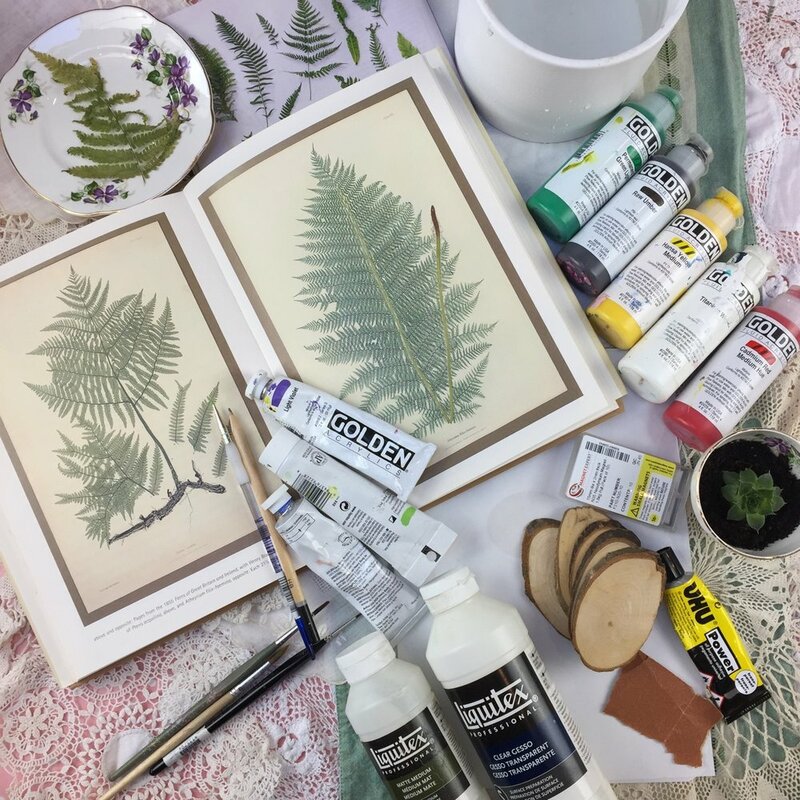 What’s brilliant about art journaling is that it’s so flexible - anything goes as Amy from the Mindful Art Studio shows in her post How To Start An Art Journal. Until you value yourself, you won’t value your time. Until you value your time, you will not do anything with it. Write out all your stresses, worries and generally anything that’s taking up head space right now - just get it all down and if you run out of space, simply write over what’s already there. Scribbling and scrawly hand-writing with spelling mistakes are all totally fine and - please put perfection to one side! Next, slap on some gesso - it’s like an undercoat for your work - preparing you for the next stage of painting over with delicious colour. You can use white, grey (this is what I used) or black gesso or, why not mix some acrylic paint into whatever colour you have. Give a blast with a hairdryer - move it around the piece so it dries evenly. Grab yourself a photo, magazine image or whatever inspires/touches you - it doesn’t have to be a portrait. Find some collage items - paper, stamps, fabric, old envelopes, wrapping paper - whatever you like and whatever you have to hand. Place and position them and then adhere them to your substrate with craft glue, glue sticks or matt medium. Dilute some acrylic paint and start adding darker values signifying shadows. Add white or lighter values for areas of highlight. I added a red scarf and decided I didn’t like the shape I’d constructed and so altered it a little. Start adding some other hues - I added various greens, red and hints of yellow. Details - I painted in a snazzy earring, a little bird, some foliage and a cute little house. Getting personal with your touches is a beautiful thing - go to town with this. Mark making - I created some loose marks on the collaged papers which kind of looked like rain and funnily enough I realised when I was finished that it had been raining. Lastly, I added some more words and this time my words had transformed from being full of angst to feeling playful, relaxed and all with a feeling of gratitude. So, I do hope you’ve enjoyed this art journaling inspiration today. My hope is that this will give you a creative and gentle way to vent some of your worries and make ‘all things new’ by painting over with a different message, one of hope and gratitude. Lastly, remember, I love hearing from you, so please let me know how you get on in the comments below. We live in a fast paced world and when we don't take the time to restore ourselves, we can feel overwhelmed and unable to relax even when we need and want to. This can all to easily lead to feelings of anxiety, restlessness and in some cases depression. Today, I want to encourage you and say that we can ALL create art that feeds our soul. If you can pick up a brush and apply paint, you can make art! Please don't think you have to be an 'artist' in order to create art that lights you up or nurtures YOU. If you're feeling overwhelmed and in need of de-stressing, look no further than a set of paints, paper and some brushes. You don't need to be a professional artist to make art and to see the benefits that making art can have on your life. Art helps you to slow down and put to one side feelings of anxiety, internal chatter and worry and instead put your attention to really seeing what is in front of you - it's very meditative. Clay - air drying paper clay is brilliant for creating a little pinch pot. Clay is so tactile and lovely to work with, you can't help but slow down and feel the cathartic benefits when you devote a little time. Colouring In - if painting your own scene isn't for you, there are so many beautiful colouring books out there and they are a lovely way to do a little creating in front of the television (or not) and enjoy the meditative benefits. 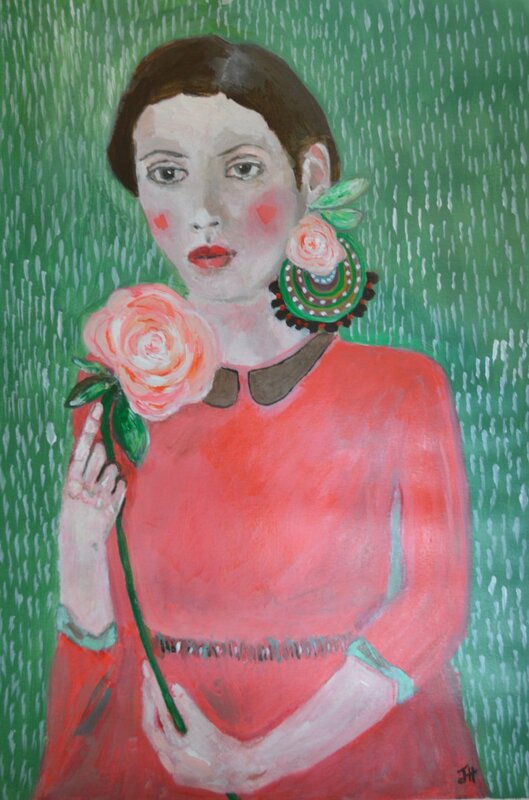 Colour - as we all know colour is very emotive - just think of a red dress versus a pale blue one. Ordinarily red, orange and yellow are warm colours and usually associated with happiness and joy but equally may represent anger. Try 'feeling' your way with colour on paper. For instance you may ask yourself, 'Do I resonate with dark blue, light pink or violet today?'. Whichever colour you choose, paint it on your paper and sit with the colours, close your eyes and take a deep breath. Paint A Face - the process of painting a face never ceases to amaze me. It's difficult to put into words but when drawing faces, it's like you're looking at a part of yourself and this allows you to self reflect and get to know yourself and your feelings better. Collage - use torn bits of magazine paper (see photo to the left), old books or any other papers you have and enjoy creating a simple scene, flower, a bird or a torn paper landscape. I also have an online class on the topic of collage called Fragments Of Joy and a personal project I'm mid-way through called Heads Up 50 (see photo above). Pattern - the creation of repetitive shapes can be very calming and satisfying. The process becomes a meditative act and can help you to reduce feelings of anxiety by using repetition ie. circles, triangles. Create With Friends - you can do all of the above and more with friends. Gather some materials, some tea and with good company you'll be creating all sorts of things before you know it! Think quilting bees and the camaraderie from creating together. Soulful Release Art - when I'm struggling with overwhelm or worry, I like to write out what's on my heart without any sensor and then I simply paint over it after having taken some time to pray and reflect. The idea is to 'cover over' the 'rubbish' and instead replace it with goodness, truth and beauty. I might listen to some relaxing music, drink some tea, sit out in the garden or just close my eyes before covering over what I've written. The process is always sacred, restorative and heart-felt (see right). I may write out a bible verse, quote or poem that also helps to bring about calm, comfort or wise words. I got a tip-off that some bluebells were flowering in the vicinity and so I decided to pursue them! I made my way to some woods nearby and it was all a bit of a last minute thing but I'm so glad I went. Painting en plein air (on-site outdoors) didn't become hugely popular with artists until the 19th century and thankfully today is still very popular even in the most challenging of weather conditions ie. the UK lol! I'm a bit of a fair-weather outdoor painter, so this is my first venture out so far this year. Sometimes it can feel a bit overwhelming to know what to take and then how to actually get started painting once you arrive, from a practical point of view. Also, some people can feel ill at ease whilst painting outdoors ie. if people want to have a nosy - this too can take a bit of getting used to but don't let it put you off. Anyway, I want to encourage you from a practical and enjoyment point of view, so what follows are some handy tips and thoughts. Remember, anyone can do this, you don't have to be an 'artist'. 1. Make sure you'll be warm (or cool enough) - think layers ie. cardigan, jacket etc. Wear comfy and practical shoes, after all, you never know where the muse might take you. 2. Bring a bag that can sling over your shoulder, is not too heavy, is waterproof (preferably wipeable if mud or cow dung gets onto it (yep, it's happened) and has ample space. 3. Of course, you need your journal/sketchbook and bulldog clips; they keep everything together. Small travel watercolour kit (including a palette), travel brush with inbuilt reservoir, paper towel, pencil, eraser, mini water-spray, pencil sharpener. Pop the smaller items into a make up bag or plastic sandwich bag (ziploc). 4. Don't forget your camera, batteries and don't do what I did, which was to run out of battery - gggrrr! Bring your 'regular' camera too. Cameras are great, not just for the 'Instagram moment' but for inspiration and possible further experimentation and reference for when you're at home. 5. A portable camping chair with it's own carry bag that can sling over your shoulder or, kneeling cushion (like you'd use for gardening) can be useful. Of course, you might not need these items but for me something to sit on is vital because otherwise my back starts playing up and/or my knees - (yep, midlife thing). 6. You need sustenance! Bring a snack or packed lunch and a drink for afterwards. This outdoor creativity thing is thirsty and hungry work! You might also need to bring insect spray, sunglasses, tissues, a map and sun protection. Oh, don't forget a paper bag for rubbish and/or bring it home with you -thinking leaving your environment as you found it. 7. Perhaps bring your journal (or write in your sketchbook) if you want to jot down a little of your process (ie. colours used) or record any other thoughts that are going through your mind once you've finished. You might not be happy with your work the first few times but that's no problem - it's a process. Make lots of thumbnail sketches and make a plan to visit again soon, so that you can 'firm up' your sketches and have another go. Don't go somewhere too off the beaten path, that you might feel vulnerable or a bit scared and therefore not able to relax. Find somewhere fairly comfortable, maybe near toilets and not so far away that you're shattered just getting there, before you even start painting. Yes, it can feel a little embarrassing at first when someone goes by and wants to see what you're doing but more often than not, it's just their curiosity and a pleasant surprise for them to come across someone painting outdoors. I find if I'm really concentrating and lost in the process, people will just walk by me and I haven't even noticed them approaching until they've walked by. Don't try to capture a really complicated scene at first. Try something small and beautiful. There is so much to be said for close up and simple. It's also lovely to just capture a lot of smaller things that catch your eye, rather than one completed piece but go with what brings you joy. Fill up your page. Give yourself ample time to enjoy the process even if you're not happy with the end result. If you're not sure what to capture with your brush or pencil, look up, down etc. You might want to capture the colour of the sky, the sculptural aspects of a rock, a shell, an abstract pattern, lichen, or the rings on a tree that's fallen. It really doesn't matter - just pick something that interests you. After I'd finished painting, I sat on a bench and listened to the birds, watched some ducklings swimming with their mum (14 of them!) and enjoyed the peace and tranquility of being outdoors, wash all over me. I even closed my eyes and said a prayer of thanks for the richness and diversity of the flora and fauna around me. I've said a lot here but really it's just about cobbling a few things together and making a pact with yourself to get out there and have a go. So, when are you ready to head out and try a little creating outdoors, you'll really love it - I guarantee! Oh and let me know how you got on - I'd love to hear.